This is a diagram I made of how I believe the Planner has set up the system. It incorporates both fate and free will. I sent it to a friend I’ve known for ten years, thinking it was an interesting possibility that he’d enjoy looking at. He immediately told me I’m mentally ill and said he needed to take time off from me. You’re free to think I’m crazy or on drugs too. I certainly don’t see myself as any sort of messiah. I’m not trying to convert anyone, except into readers of my books. Amend that: into buyers of my books. The fact is I’ve always been on a quest to figure out if we’re here for a reason. The theory I’ve illustrated here makes sense to me, but it’s just an art project. I had no idea it would convince someone that I’ve lost my marbles. As a writer and penny-ante artist, all I can say to that reaction is, “Excellent!” I’d rather my work make people think I’m a frightening lunatic than just another run-of-the-mill, struggling mediocrity. Scary cranks sell more books than bland, everyday paragons of normality. As an aside, if you’re worried about someone’s mental hygiene, beware of those who insist that they have no problems. Read my memoir. You’ll see that I’ve got problems falling out of every orifice. If that makes you run from me in horror, so be it. I’ll live. When I decided to write Ghosts and Ballyhoo and address issues that have always been at the forefront of my consciousness, I knew that it would change peoples’ opinion of me. My late father was terrified of different ideas. The sentence he repeated the most often in his eighty-four years of existence in this cycle was, “He’s some kind of a nut!” Anyone who described thoughts that were even slightly out of the realm of day-to-day drudgery was a maniac. I’m not afraid of being seen as a toad, even by my former friends. Solitude doesn’t scare me. I’d like to suggest, though, that if the mere expression of an idea freaks you right out of your skull, to the extent that you have to end a ten-year relationship, the problem might not lie with the person expressing the idea. Anyway, back to my diagram. I believe that we each have a specific destiny the Planner lays out for us, which takes the form of opportunities we’re given. Our free will comes into play through the choices we make when presented with these opportunities. Each choice we make has the potential of changing our destiny, and some choices create other opportunities. Some opportunities are laid out in advance, while others are nascent, ready to come into existence based on our choices. The end result is a continuum of destinies, from positive to negative. This ultimate fate is also a starting point for your next life. 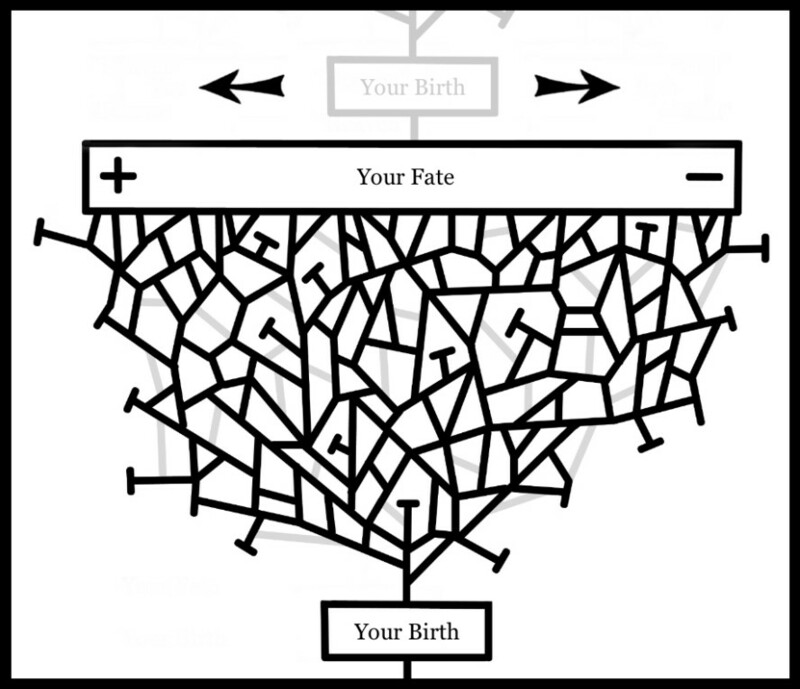 In my diagram I’ve illustrated our individual fate as a long block, positive on the left and negative on the right. Each fork or intersection of the many lines leading to our ultimate fate represents a choice. The light-gray lines have yet to come into existence but can be created by our choices. Some choices lead to dead ends, which automatically drop us on the negative side of the Fate Block if we end our lives in these cul-de-sacs. When it’s time for us to begin another cycle, we’re born again somewhere along the continuum of fate. Those who end up on the far right have a lot to learn in the next life. I don’t believe that the starting point is punishment; for example, I don’t believe that if you made terrible choices in this life, you’ll get raped or tortured in the next life or be born as a Brazilian favela dweller. That wouldn’t be just, because the person you become isn’t responsible for the actions of the person you once were. And the system is benign, I believe. It’s about redemption, not punishment. However, if you go through a lifetime without learning anything, you end up—of your own accord—on the negative end of the Fate Block, which means you begin the next life at a greater disadvantage than someone who grew and improved. This isn’t comeuppance; it’s natural law. The fact that a cat will never be able to command a nuclear submarine has nothing to do with whether it’s a good or bad cat. Cats simply lack the ability to issue coherent orders to submariners. Those whose fate is closer to the left side of the block will begin their next lives already knowing much more than those whose fate brings them to the right side of the block. I believe our purpose here is to learn, so those with less to learn are happier and more successful as people, not in a professional or material sense. Though happier people may be born into difficult circumstances, they’re better able to deal with them. Our choices determine where on the Fate Block we end up and how much we’ll have to learn in the next life. What we do in this life doesn’t determine what will happen to us in the next life. That’s based on pure chance. But what we do in this life influences how we’ll cope with the circumstances of the next life. I believe we accumulate or bank our learning. The Buddhists think that the number of cycles we must go through is dictated by how much we learn. That makes the most sense to me. Once we get where we’re supposed to be, we achieve what the Buddhists call nirvana and don’t have to keep coming back. It’s likely that nirvana is a state of pure clarity, awareness, and contentment, which means concepts such as time and the lower human emotions will have no meaning. In other words we can’t even conceive of what it’ll be like. But I think it’ll be pretty cool. And I think we’ll be there with the people who mean the most to us. Supplement to “Watch for the Patterns” and “Be Grateful,” pages 273 to 275.